We are all so busy these days – rushing around often hardly having time to catch our breath. The last thing on our mind is making time to exercise and we seem to have no qualms about using our lack of time as an excuse not to do it. But what if we improved our time management so we can fit in just two sessions each week of a proper efficient strengthening exercise program? Think of the benefits to our physical, mental and emotional health and well-being we would receive. And the best time to do it? It’s first thing in the morning of course and here are 10 darn good reasons why it is the best time. 1) You will feel more alert and productive for the rest of the day. 2) It allows you some “me” time to plan your day, distress and do any problem solving or simply let something “go” that has been bothering you. It’s a chance to recalibrate your mind and its programming. 3) Putting exercise first on the totem pole of priorities for the day means there is a good chance nothing will get in the way. If the day gets busy it is easy for your session to take a back seat. more calories all day long. 5) It puts you in a “healthy mindset” so you make better food choices for the rest of the day. 6) When your early morning sessions become a solid habit you will find your body is ready and your mind is willing to be active when you wake up. Your innermost being, deep inside your “soul” looks forward to it as the human body was made to be active….very active. 7) When you have firmly established the exercise habit it will shift from just “something you do” to “something you become”. Placing it first on the list and giving it the priority it deserves makes it easier to stick with long term. 8) You will feel really good all day knowing you have set aside and completed the task of healthy time for your body, mind and soul. This helps dissipate any build up of stress if you live a busy life or have a demanding career or business. 9) Over 90 percent of people who exercise consistently exercise first thing in the morning. If you want to exercise consistently odds are in your favor if you do it first thing in the morning. 10) An exercise session first thing in the morning helps balance appetite regulation hormones so you have fewer cravings, are able to make better choices and are less likely to binge or overeat later in the day. But a word of warning here. As a gym owner the thing most likely to cause you to drop out before you have even experienced the benefits is DOING TOO MUCH TOO SOON. So many people think they can come to the gym 4 or 5 times a week (or even every day) and it will stick. Allow yourself to be a beginner. No one starts at the top. Start with just one or two sessions a week. When you those firmly cemented in your life (like after 3-6 months) try for a third time. If that doesn’t fit, cut it back to one or two again and keep it there. You would get excellent results if you only went to the gym once a week for the rest of your life. Way better results than the “all or nothing” mindset that cause so many people to crash and burn with their exercise program….yet again. Some more tips to make it easier to develop the “early morning” exercise habit. 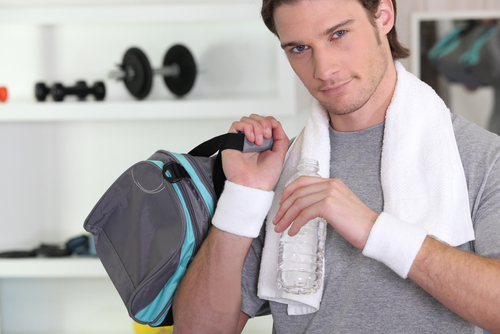 • Pack your gym bag the night before and have your workout clothes ready. Knowing that everything is packed and ready to go will make it easier to get up as you don’t have much to do and you can be out the door quickly. • Make a workout schedule – At the end of each week, I write out my workout schedule for the coming week. I don’t always stick to it exactly, as sometimes things come up, but seeing it all written down makes it easier for me to stick to. I know I have to get up at 6am for my workout, so I do. • Move your alarm clock to the other side of the room – If you have to actually get out of bed to turn your alarm clock off, then you are less likely to go back to sleep again. • Make sure you have great music on your iPod – I put my favourite songs onto my iPod and reminding myself of that when my alarm goes off makes that workout much more appealing. • Give it time – This isn’t going to be something you will instantly be able to do, so give it time to ease yourself in to it. But, your body with adjust to your new routine after a few weeks. • Plan your breakfast – Knowing that I have a nice breakfast after my workout makes it that much easier to get it done. • Get enough sleep – It goes without saying, but if you are not getting enough sleep, then you are not going to want to get up early. The decision to watch that movie that you know will extend well past your bedtime will put getting up early at risk. Make the right decision here. Fall in love with the process and the results will follow. You can train yourself for success or you can train yourself for failure, so, be your own coach and get yourself going.